Participants select from three options depending upon their investment needs and objectives. The three investment options are: The Growth Fund, The Income Fund, and The Balanced Fund. The three funds cover the spectrum of long term, short term, and intermediate investment strategies for capital growth and income. Objective: Long term growth of capital over time with a high tolerance for risk. Maximize current income with modest risk. Maximize capital appreciation with modest risk. Investments: Equity securities and cash equivalents. Bonds, preferred securities and other income producing securities. Equities, preferred, and a wide range of income producing securities. 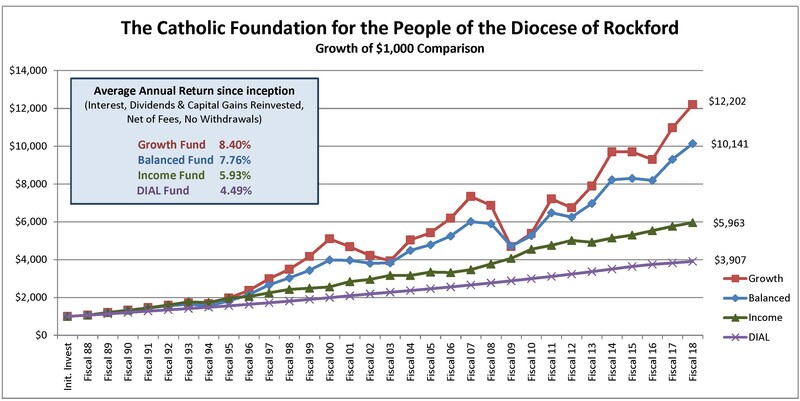 Currently allocation of the Fund’s assets is 70% Growth and 30% Income. Investment Style: Large cap, mid cap and small cap, international and emerging markets. Bonds, preferred securities, covered call writing and other income producing securities. Large cap, mid cap and small cap, international and emerging markets. Bonds, preferred securities, covered call writing and other income producing securities. Return expectation: Perform in line with the following: 1) similar allocated portfolio of unmanaged indices, 2) similarly allocated Foundations throughout the country, and 3) CPI plus 5%. Perform in line with the following: 1) similar allocated portfolio of unmanaged indices, 2) CPI plus 2.5%. Perform in line with the following 1) similar allocated portfolio of unmanaged indices, 2) similarly allocated Foundations throughout the country, and 3) CPI plus 4%. Participant Profile: You seek stock market growth potential and are willing to accept more risk in order to seek greater long-term rewards. Your need is for current income. You seek a combination of income and capital appreciation and are willing to forego some income in exchange for moderate growth of capital. You are not looking for current income. You are looking for higher income potential than currently available from Certificates of Deposit, Money Market Funds or Treasury Bills. You like the flexibility of investing in stocks, bonds, and preferreds, seeking the greatest potential for reward. Time horizon is long term. Time horizon is intermediate to long term. You seek a portfolio that will serve as a hedge against inflation. You are less willing to accept market risk. You seek Income return with the added dimension of long-term growth. Exposure to foreign and domestic markets. Seek income producing securities. Diversification designed to help reduce risk and volatility. A portfolio with a diversity of investment styles including large cap value, mid-cap, small cap, international, and emerging. A portfolio with a diversity of income producing investment styles. Stocks and bonds, domestic and international equities, value and growth style investment management, and large and mid-cap equities. Full-time professional, independent portfolio management. Full-time professional, independent portfolio management. Full-time professional, independent portfolio management.